Students and alumnae at Smith College are creating a scholarship fund for illegal immigrants who wish to attend the college. The activists hope to raise $10,000 for the scholarship fund. 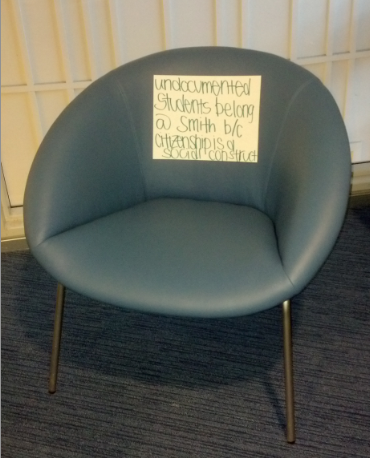 Smith does accept illegal immigrants, but classify the students as international students in the admissions policy. Students and alumni at Smith College are raising money to create a new scholarship only for illegal immigrants. The all-women’s college in Northampton, Mass., is raising money to fund a $10,000 scholarship to be awarded to an illegal immigrant matriculating to the school. While the $10,000 scholarship would be nowhere close to even one year of the school’s tuition, campaign organizers say they hope it will encourage the college to give a full scholarship to an illegal immigrant. “Undocumented applicants, many of whom have grown up in under-resourced U.S. communities, must compete with wealthy international students who have often had access to elite schools and extensive resume building opportunities." “Our hope is that it will be enough to convince the College to admit—and fund—a qualified undocumented student who otherwise would not be granted admission,” reads the campaign site on INDIEGOGO, which tells the story of five illegal immigrants from Georgia who fell in love with the college. The students saw it as “a breath of fresh air” compared to public universities in the “anti-immigrant” state of Georgia, which does not allow for undocumented students to attend the state’s university system. The site explains that students who reside in the U.S. illegally and apply to Smith College are placed into the pool of international students, which can be “twice as competitive” as the pool of domestic students. At Smith, the international student pool is “need conscious” which means that when deciding admission, Smith’s admissions staff take students’ personal finances into account. Currently, Smith College accepts and evaluates applications from illegal immigrants. Students at Smith College have developed an Organizing for Undocumented Students’ Rights group (OURSR) which is hosted by Students for Social Justice and Institutional Change. The group is not only pushing for the development of a scholarship for illegal immigrants; it has also participated in advocacy events including a school-wide campaign in which students placed signs on chairs highlighting the school’s current acceptance policies on illegal immigrants. Colleges across the country have been adopting their own application and admissions policies for illegal immigrants. Currently, New York University offers scholarships to illegal immigrants, and Harvard University recently gave a full ride to a student when he informed them that he was residing in the country illegally. Oberlin College in Ohio has also raised money for a similar scholarship. Campus Reform reached out to Oberlin alumna and progressive activist Lena Dunham for a comment, but she did not respond by time of publication.